The Electrical Menagerie, a one-of-a-kind robotic roadshow, is bankrupt. Sylvester Carthage, illusionist and engineer, has the eccentric imagination the Menagerie needs to succeed creatively - but none of the people skills. Fast-talking Arbrook Huxley, meanwhile, has all the savvy the Menagerie needs to succeed commercially - but none of the scruples. To save their show, Carthage and Huxley risk everything in a royal talent competition, vying for the once-in-a-lifetime chance to perform for the future celestial queen. In this stardust- and spark-powered empire of floating islands and flying trains, the Electrical Menagerie's bid at fame and fortune means weathering the glamorous and cutthroat world of critics, high society, and rival magicians - but with real conspiracy lurking beneath tabloid controversy, there's more at stake in this contest than the prize. Behind the glittery haze of flash paper and mirrors, every competitor has something to hide...and it's the lies Carthage and Huxley tell each other that may cost them everything. I was sold by the title and cover. Who wouldn’t want to enjoy the wonder of steampunk circus? The story started with a classic “we have to save the show” storyline and I was happy enough for that to be it. This story did so much more! Each stage of competition brought out new sides of the characters and their back stories. Chekov’s guns were set up so well I didn’t see them coming. Mystery and intrigue! Sabotage! Showmanship! And a truly epic conclusion. Travis Baldree did a fantastic job. He nailed the various characters and accents – including making me care about a certain automaton. There was peril but I think anyone middle school age and up could handle it. Anyone who can still remember a sense of childlike wonder at their first magic show will treasure this story. I look forward to re-reads in the future and hopefully more stories in this world. The story is quite magical, both in the story it tells and the feeling it gives you. You get the feeling of the old traveling circus with some futuristic upgrades. I don’t really know what steampunk is but this definitely worked. Throughout the story there is always a little something that adds some fantasy to the overall world and the storyline itself. Reeder does a really good job establishing her world and I enjoyed listening to her descriptions of everything. She definitely has a way with words. The two main characters, Carthage and Huxley, are a great duo and play off each other really well. It was like listening to two long time buddies while they reach for the stars, even though they aren’t quite friends. The development of each was done really well and often I got wrapped up in who they were versus what they were doing. I definitely look forward to more of this duo on their magical journeys. Not sure how this fits into the historical fiction category, I would call it more of a science fiction mystery. This had a few different mysteries that unfold throughout the story and the one that was the most touching was Carthage’s family mystery. Travis really knocked the narration out of the park for this. This story really allowed him to show his full range of character voices and accents. You can tell he really enjoyed narrating this book as his enthusiasm really brings the entire story to life. His narration paired with the fun dialogue really brought out all of the character’s emotions. It really sounded like he was acting out the story versus just reading it. This was the second time I have made the journey through the Celestial Isles, and hearing it made the trip such a magical experience. Travis Baldree did a wonderful job voicing all of Mollie’s characters. I cannot wait for the next installment of the series! An entertaining steampunk circus murder mystery! 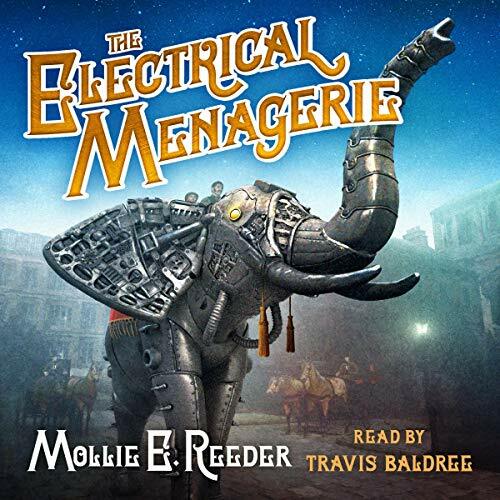 The Electrical Menagerie by Mollie E. Reeder and narrated by Travis Baldree is an audible book I requested and the review is voluntary. This was a fresh change from what I had been reading. I love steampunk and this was excellent! Adding in a circus feel, the steampunk, and then murder, and more, it took this novel over the 'big top'! Loved the characters, especially one of the "electricals". Plot and twists kept the story rolling. With Travis Baldree as narrator is was bound to be good! Excellent voices and emotions! Great job! As Magical as the Circus! Initially the cover grabbed me on this book. I love elephants. Then, I read the synopsis. It grabbed me. The only thing I was not sure about was the steampunk aspect. I am very hit or miss with steampunk. I would categorize this book as steampunk, fantasy, and mystery. I was captivated pretty quickly. The two main characters Carthage and Huxley each bring their own unique skill sets to their failing circus. They hear about a competition and decide to enter it. Once they have made it into the competition someone starts trying to sabotage, in order to win. With where Carthage and Huxley's relationship seemed to be in the beginning I was not quite sure how the story would play out. I loved how their relationship grew and how they were their to support each other. It shows that friends fight and disagree, but what really counts is are they there for you when you need them. This books is a fun mix of many things I love the circus, nods to the Victorian era, mystery/fantasy, and an ending I was not fully expecting. This was mostly because I was still questioning the relationship between the two main characters. It looks like this book will be a series. The only thing to say with that is, I hope there is a little more world building in the second book. I want to explore this work so much more. That being said, I really cannot wait for the next book to come out! I will be listening to this book again and again. It is a new favourite. Travis Baldree's unique voice lends itself to this world. I quite enjoyed his narration and I hope he will continue on with the series. I was given a copy of this audiobook at my request. I have voluntarily left this review. I was surprised when I first began the audio book. I am new to audio books and wasn't sure if I would enjoy it as much as I enjoyed the paperback. However, I was pleasantly surprised and was really captured by all the voices used in the story (what talent, to change accents so often and quickly!). I'm impressed. Well done! Carthage, of course, was my favorite accent, but I have to say that Huxley was actually the voice that I was impressed by the the most. The narrator cleverly gives him his own unique inflection and phrasing, which I think is really hard to do in your "own" accent. This is such a clever story, and it moves quickly so there's never a dull second. The world is created with care and precision, it has a familiar sense to it, but it's all new and wonderful. The characters' goals are well defined and the ending is... sensational. ;) I can't wait for more adventures with these two boys! First of all, Travis Baldree is a great narrator. He really brought this one to life and made it a very entertaining listen. The thought that kept coming to mind was this was like a steampunk greatest showman without the music. The story had a lot of heart and a surprising amount of depth. This was just a great story and I can't wait for the next book. Even as I write this, it suprises me how much I enjoyed this book and just how much I want the next book to come out soon! Steampunk isn’t my normal thing, but the author offered me a review copy & I jumped on it. I was immediately captured by the narrator, but the characters & world made this one of my favorite reads so far this year. Well done! This is an imaginative story. I like the way Mollie Reeder creates a world full of the impossible. When you have a flying horses, electric jugglers and a train in the sky, then you have to have a great imagination. Very much enjoyed the story and I'm looking forward to book 2. Travis Baldree does excellent in narrating the story. What a fantastical joy. Getting steampunk fantasy just right is tricky, but this author gave us just enough of everything. The world building is fun and not over-explained, the characters are sharp and well-drawn, the story and adventure are a proper roller coaster. The bond between the main characters are great, the emotion well written. I could keep gushing but I will stop there. The voice artist on the audiobook was fantastic. Bravo!